System waterside monitoring is always necessary in commercial or industrial water systems to keep running costs to a minimum and to comply with health and safety legislation and operational and/or industry requirements. We have experience of monitoring all types of water systems, including commercial, domestic and industrial, heating, cooling and steam raising applications as well as process and waste facilities. For all types of water based systems, we are able monitor the relevant physical and chemical parameters required, in order to provide cost effective, efficient and safe operation of plant and equipment. Our trademarked vSteam® web based monitoring system extends to all types of water based systems, including but not limited to Cooling Towers/Evaporative condensers, heating systems, chilled water systems and all types of closed loop systems. We therefore not only offer on-site monitoring but also remote monitoring and training, via our vSteam® system. Typical problems that we often find include high levels of acidity or presence of dissolved oxygen, leading to pitting corrosion or low pH attack and high mineral content leading to scaling and chemical sludge formation. Additionally, some types of bacterial growth can lead to disease, some can form films within pipes reducing heat transfer rates, some can cause corrosion attack and others can impede the effect of chemical water treatment. In boilers, an eggshell thickness of scale deposit can reduce energy efficiency by approximately 10%. A bacterial film of the same thickness reduces energy transfer by approximately 30%. In taps and shower heads, scale can harbour Legionella bacteria, allowing it to enter the aerosol phase, when the shower is turned on and so raising the risk of Legionellosis. For your own system, we would design and then recommend a bespoke and cost effective monitoring plan, which will ensure all possible risks are identified and that changes in condition state are highlighted early. Following our initial inspection, we can supply test kits, a schematic diagram and a robust monitoring plan with timescales so that testing and monitoring becomes very straightforward and routine. We produce detailed charts showing performance over time – a great problem-solving tool. When you enter data into your control panel, results are automatically colour coded in red, amber and green to highlight the urgency of remedial action. It is easy to obtain a snap shot of system compliance at a glance. We add our own comments and recommendations to this plan and install dosing and control equipment for simple administration of remedial treatment. 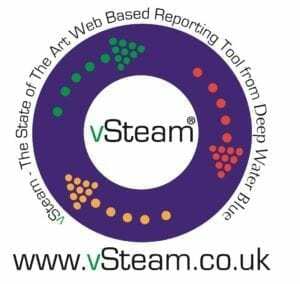 Our trademarked vSteam® web based monitoring system completes our comprehensive and unrivalled offering. To discuss system monitoring in more detail, call us on 0870 460 2980.